...or is that just another way of saying 'pink and green' , a colour combo I seem to be overdoing at the moment. (It's our current challenge at Inkspirational). Anyway, I do love an oriental theme so I had to enter the challenge at Allsorts. 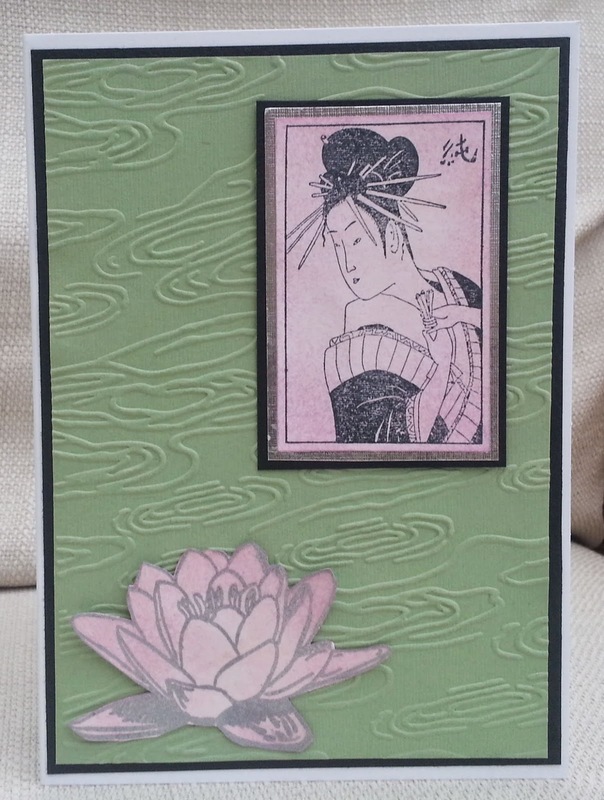 I normally go for a more ornate oriental look, with rich and dark colours, but I had a piece of card on my table which I'd used to mop the ink of my mat from a prcvious project, stamped the geisha on it (make unknown) and liked it. I stamped and embossed the lily ( Sheena Douglass) on the same cardstock and, on both images, stippled the edges with Orchid Brilliance ink. The background embossing folder is also Sheena Douglass. For my project I relied heavily on my digital die-cutting machine. First I cut out a bicycle, (which I cut in half) and then I cut out these lovely flowers and leaves, kindly provided by one of our sponsors, Fred She Said. 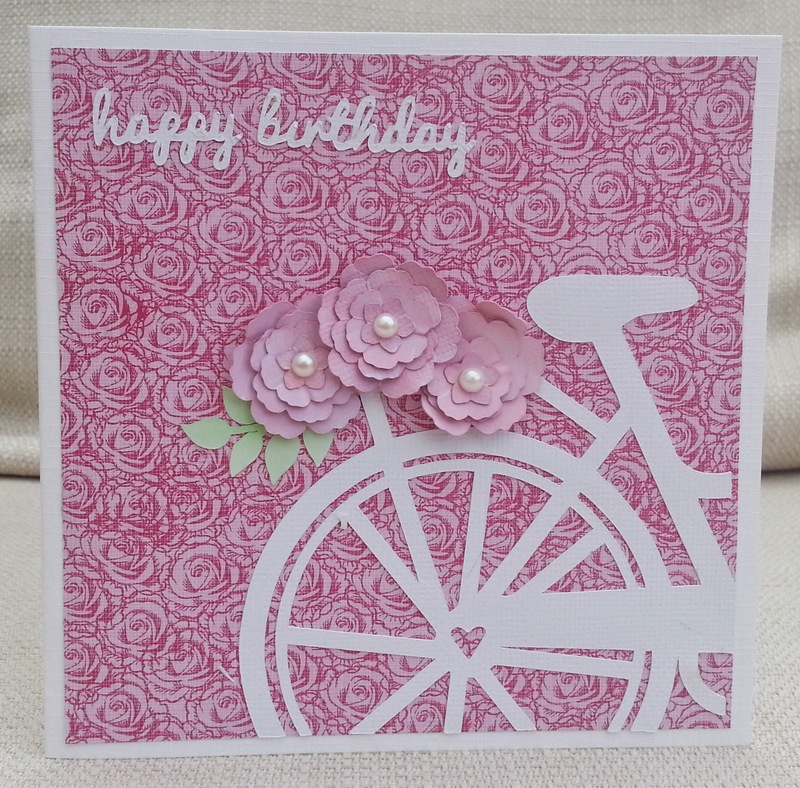 I coloured the flowers with two colours of pink ink and assembled them with a pearl centre. How does the photo inspire you? Come over to Pinspirational Challenges and join in - we have fabulous prizes to win, provided by our sponsors. 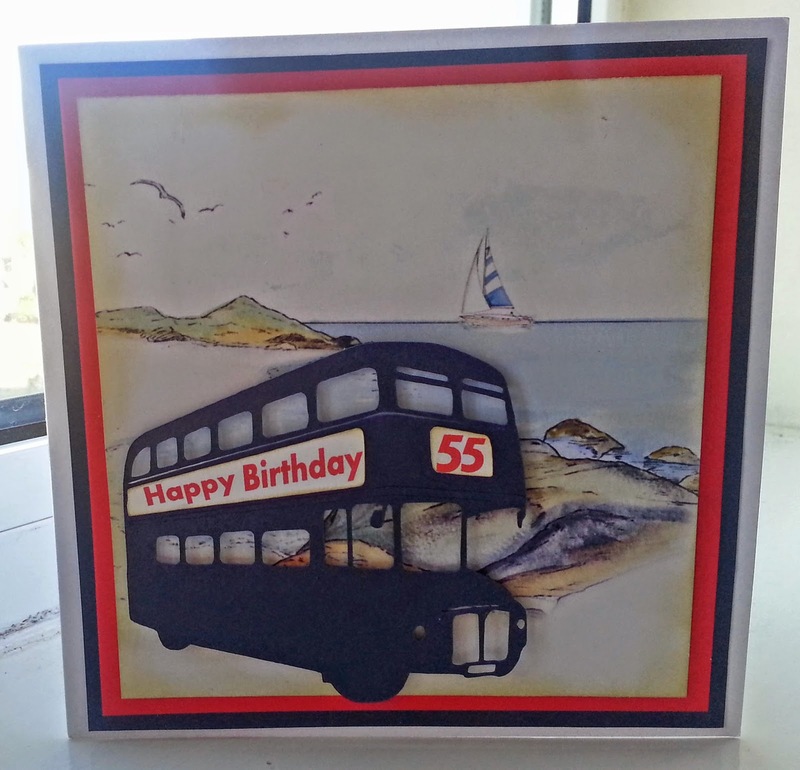 My partner is a 'classic bus enthusiast' who owns two doubledeckers and organises an annual bus event in a seaside town. I think you can see why I made this card! We've been together ten years and it's a challenge to keep coming up with fresh bus-themed ideas! I found a free 'vector' image of a bus silhouette on the internet, opened it in Photoshop and converted it to a PNG. Then I pulled it into Silhouette Studio , traced it and cut it. I typed in the numbers and sentiment and used 'print and cut'. The seaside background was composed from the picture builder section of My Craft Studio 'Setting the Scene' CD. Then I just inked and mounted everything. Looking at the front of my bus, bet you can't guess how many candles he'll have on his cake! 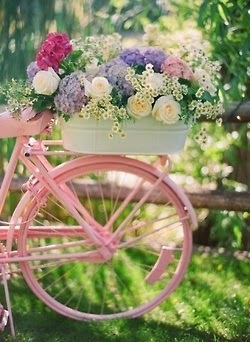 We have a spring-like colour combo at Inkspirational this time - green and pink. For my DT card, I used an A Day for Daisies image, printed directly onto the patterned paper. 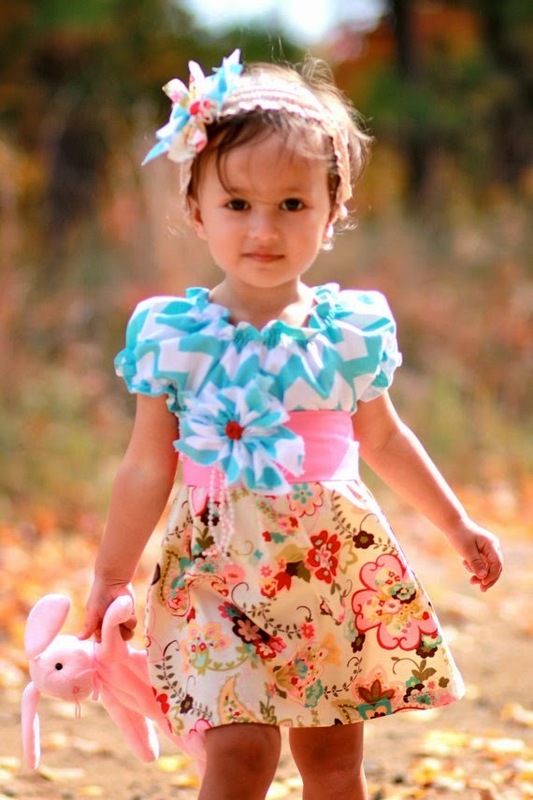 Then I paper-pieced her dress with a different pp. The leaves were already on the patterned paper so I highlighted them with pearls and gems and stamped the sentiment. We'd love you to join us at Inkspirational with your green and pink creation. We have a fabulous Guest Designer, Alycia, so please do come and have a look. I love robins. We see them in our garden all year round but I still love them as an image for Christmas cards. 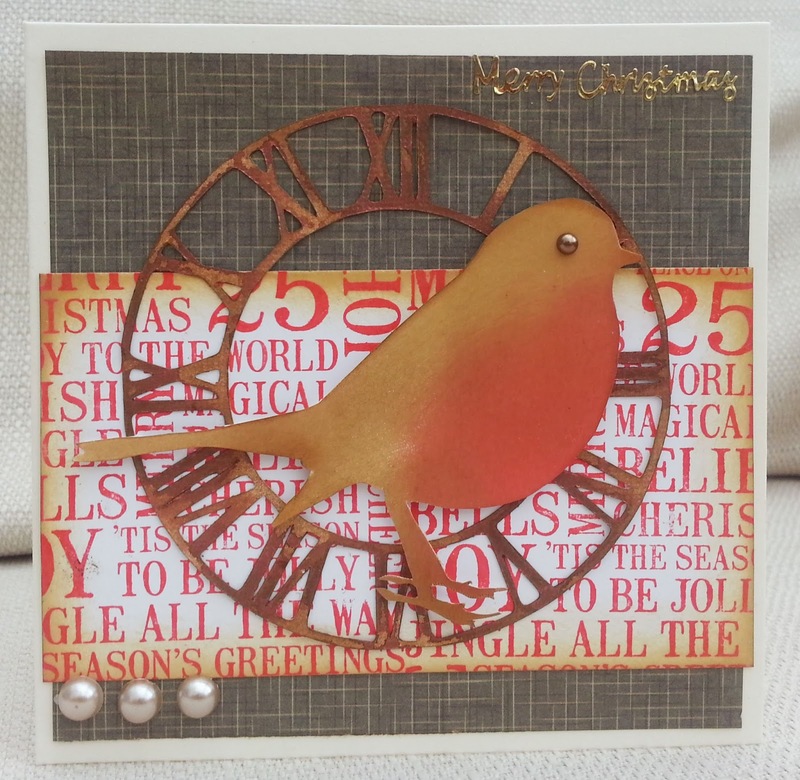 For this card I cut the robin on the Silhouette, out of Kaisercraft patterned paper, with the breast cut out of white card and coloured with 'Barn Door' distress ink. 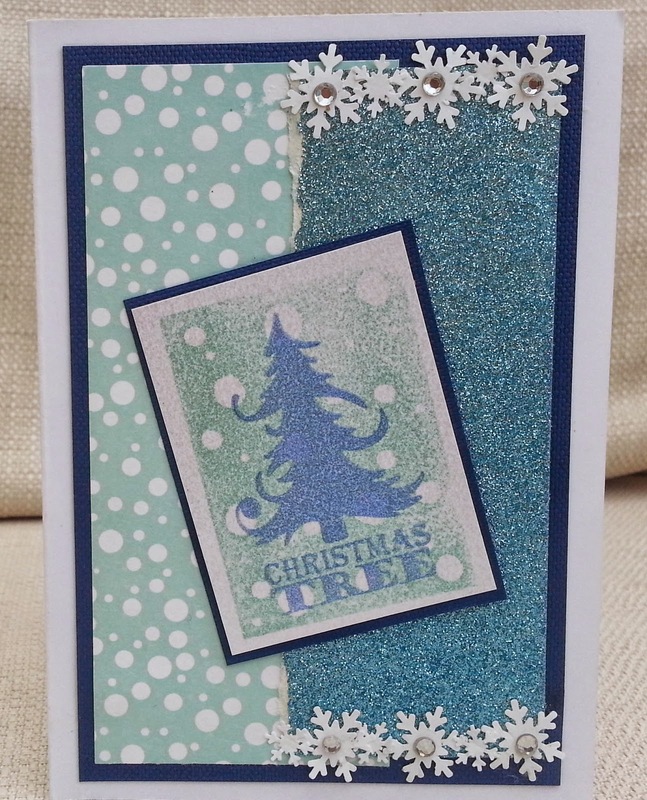 I embossed the ivy on colour core card and sanded it. I used two lovely pre-made die-cuts form My Mind's Eye and a Martha Stewart border punch. I put it together using the sketch from Just Add Ink. We had an hour to fill between dinner and bed, and my 7 year old said-'Let's do crafting' and I know what that means... He loves to grab my box of spray inks and use as many as possible! This is no job for flimsy cardstock, so I chopped up an empty cornflakes box . And while he was drenching his with as much ink as he could, this is what I made. 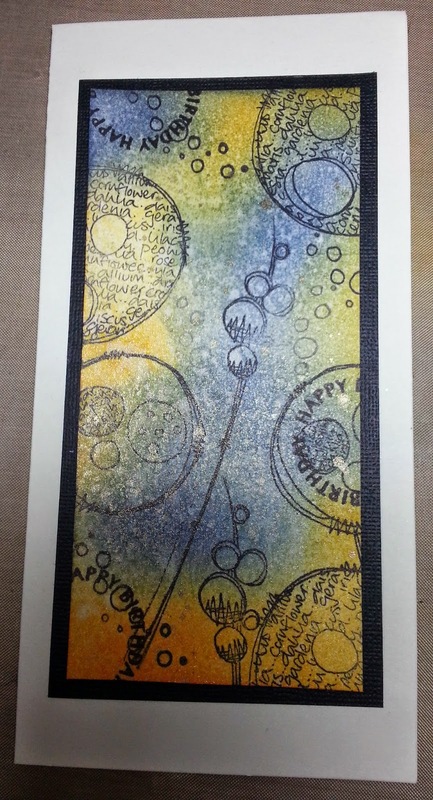 I used two colours of distress ink pads, sprayed with water, then stamped with Paper Artsy JOFY stamps. 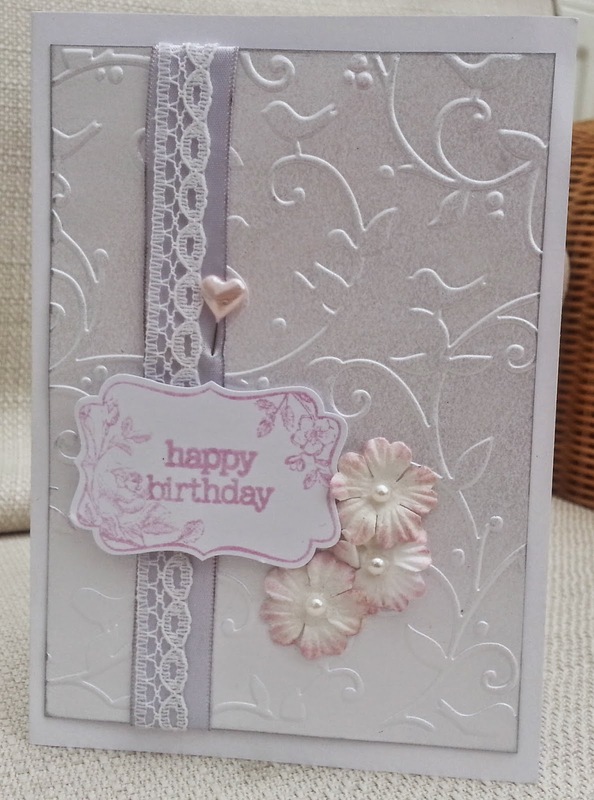 Then I used Perfect Pearls Gold spray and finally, stamped with a circular 'happy birthday ' stamp (origin unknown). Here's a birthday card for another of my nephews, but this one is only five. I used a Lili of the Valley stamp and paper scraps, which I severely distressed! A few days ago, I was surprised to discover that my stock of birthday cards was running perilously low, so I am trying to make some now. 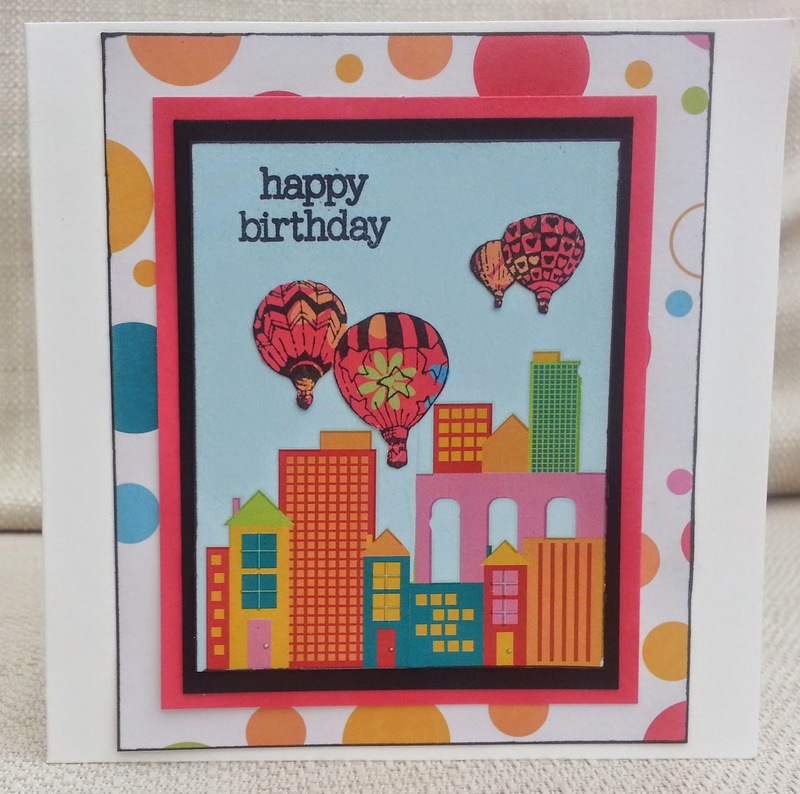 The first card here was made using rub ons (the buildings) and a very old All Night Media balloons stamp. 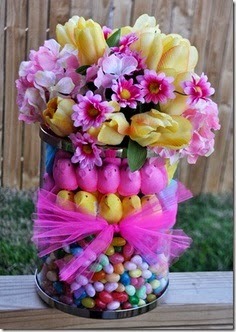 I'd like to enter this into Curtain Call (Confetti crush) and My Time to Craft (Up, up and away). The second card was going to be a 'white on white', but I really couldn't get the panel with the sentiment to stand out enough so decided to add a little pink. (I hope it doesn't look too much like a wedding card!). 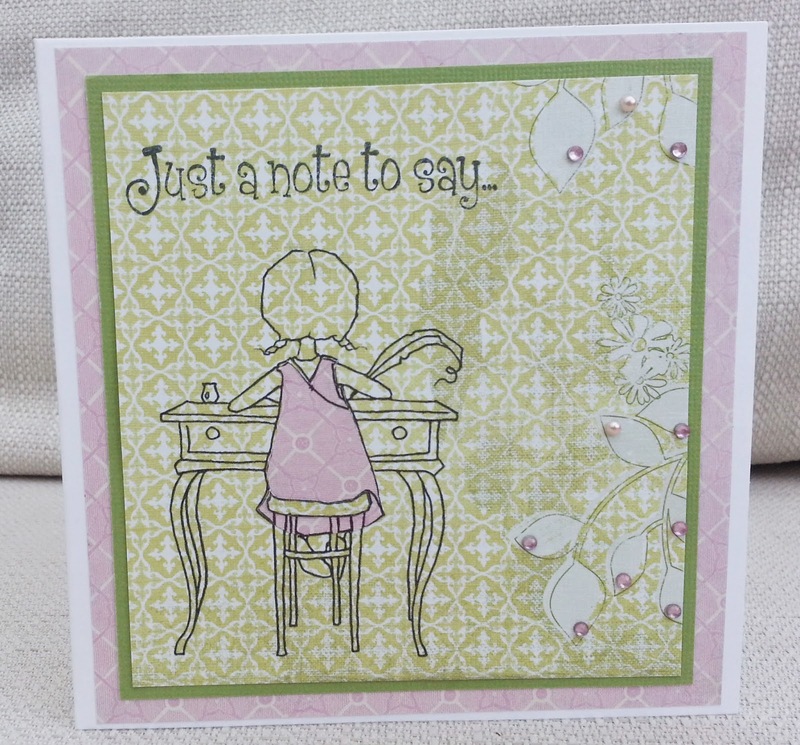 The panel is a Stampin Up stamp with a matching punch , and I added a sentiment (unknown) and used the same ink to colour the tips of the white flowers. I know the ribbon looks grey in the photo , but it's a pearlescent white. I'd like to enter Crafty Creations (white plus one other colour) and Seize the Birthday ( white on white or ag - well, I nearly made the optional theme!). Earlier, I posted a card featuring a robin cut out on the Silhouette. After I made that card, I was looking at the hole left from the die-cut and decided to try using it as a stencil, using the same brown and red Distress Inks that I'd used earlier. It's a softer look , I think. The text stamp is by Darkroom Door. The clock is a die-cut, coloured with ink and copper stain. 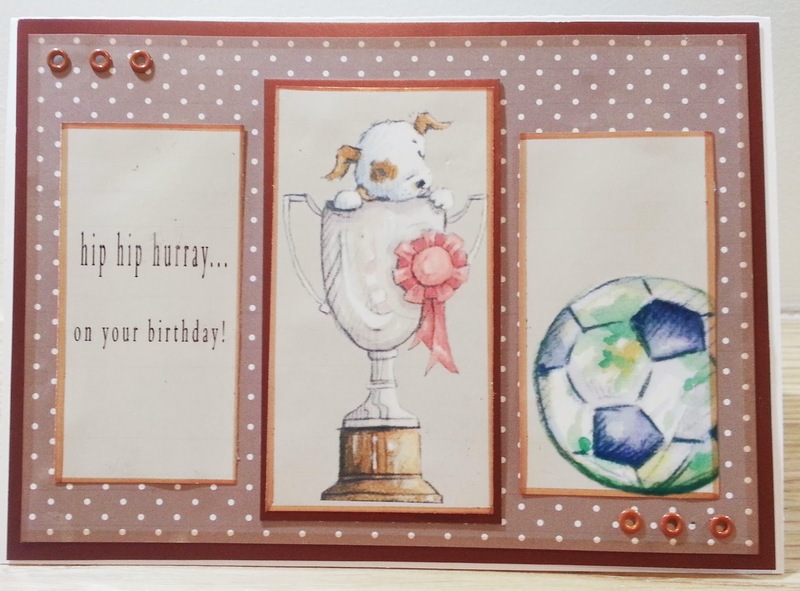 I'm lucky enough to have two weeks off work at the mo, but I've realised it's my friend at work's birthday on Saturday, so I need to post her a card tomorrow. No problem, I thought, I'm always making cards. But when I looked, I had 'thank you', 'new baby', 'new home', 'get well soon', 'Christmas'........ very few birthday cards and they just didn't seem right for my friend. I suppose it's because often I make a bday card with a particular person in mind. So I decided - a) I need to stock up on bday cards , and b) I needed to make one quickly! In a hurry, I find my Silhouette Cameo , and a couple of challenges, invaluable. I had already intended to enter the City Crafter challenge 'balloons' , because I can't use enough images of hot air balloons , I love them so much. I also spotted a useful -looking sketch at Feeling Sketchy. 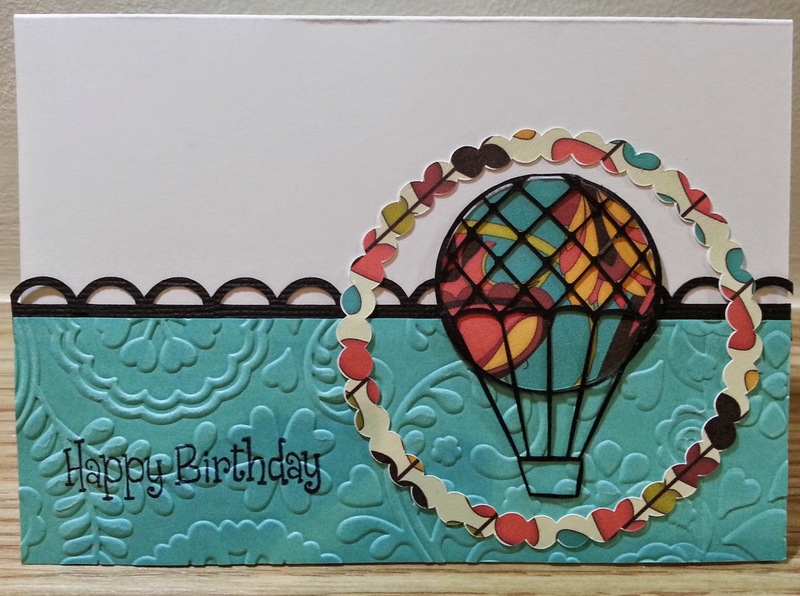 So, I cut out the balloon, border and scalloped circle using the Silhouette Cameo, Kirsty Wiseman patterns and black cs. I stamped some turquoise cardstock with a Woodware(?) sentiment and then embossed it with a Cuttlebug folder. 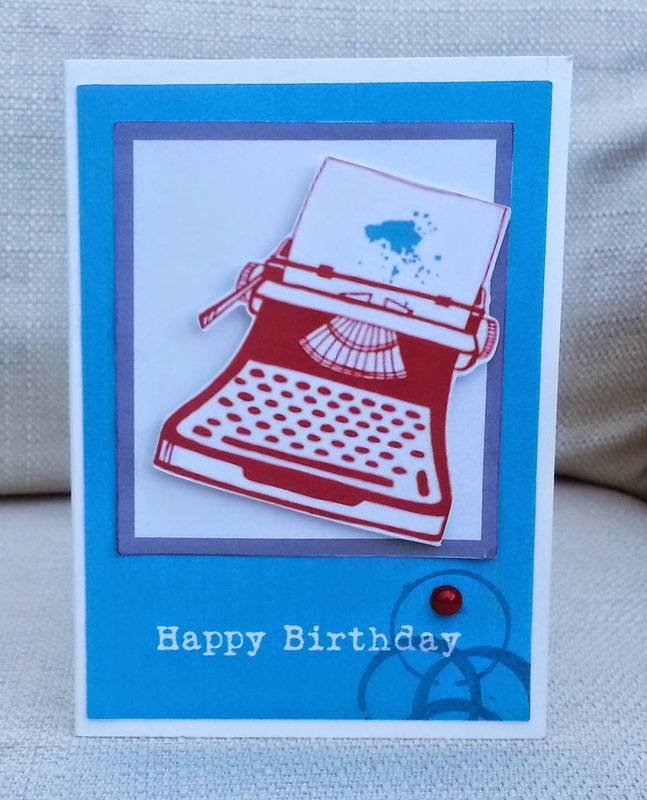 This is a birthday card for my nephew, who is in his twenties and is a computer 'whizz' - I hope he will know what the typewriter is! 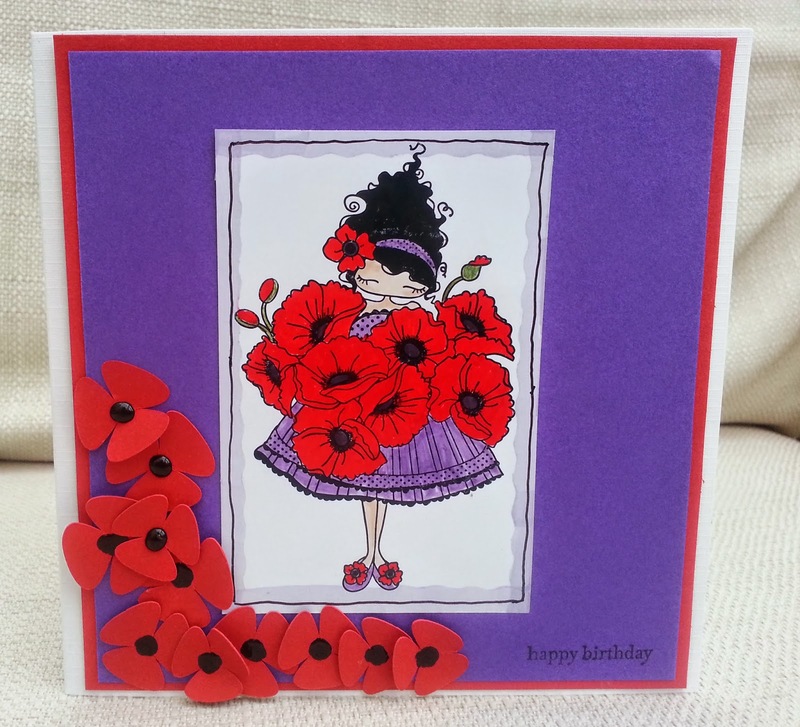 I used a sketch and colour scheme from a new challenge blog , Poppy Sketches . The typewriter is from a Serif Craft Artist CD ( not sure name of CD as contained several digi-kits - this one was Vintage Typewriter.) I added the ink splodge and recoloured them both to match the colour scheme. Then I brought it into the Silhouette Cameo for cutting. I downloaded a typewriter style font for the sentiment and stamped a Paper Artsy grunge stamp over it, adding an enamel dot. P.s - Looking at the colours on my computer screen, they do not look the exact red, teal and grey of the real card! 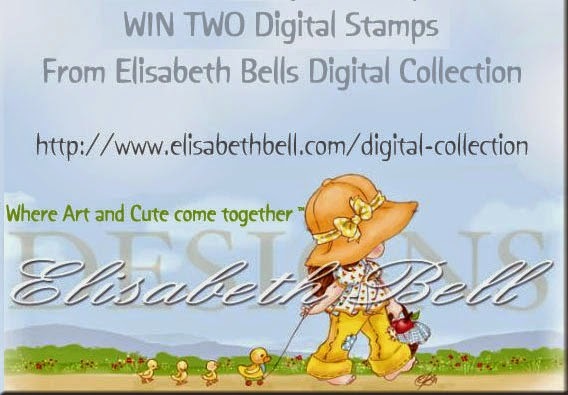 As you can see, I noticed the bunny the little girl is holding and picked out a bunny detail in a digi, kindly provided by one of our sponsors - Elisabeth Bell. Please come over to Pinspirational and join in with the challenge. Just quickly scheduling this before I clear off for a crafty weekend. The tree stamp is Woodware. 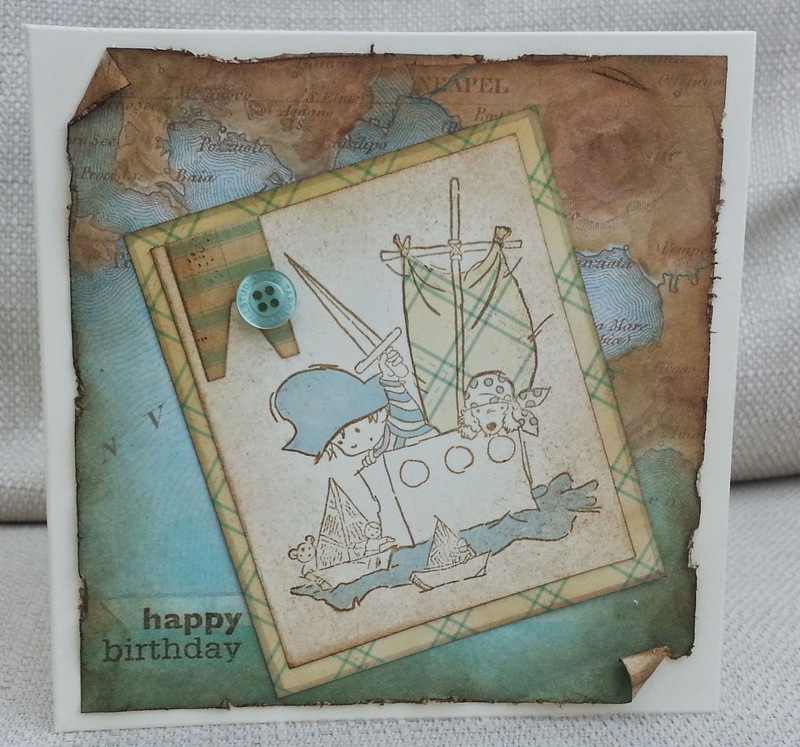 The background behind it is a Hero Arts stamp which is very similar to the patterned paper I used at the back. I also used very gliterry glitter paper, Martha Stewart punch and gems. 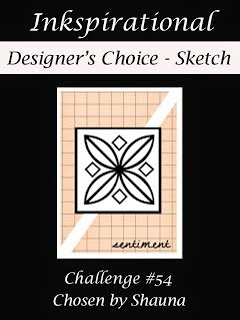 Here's my DT card for Inkspirational Challenges and here is the sketch we are using. 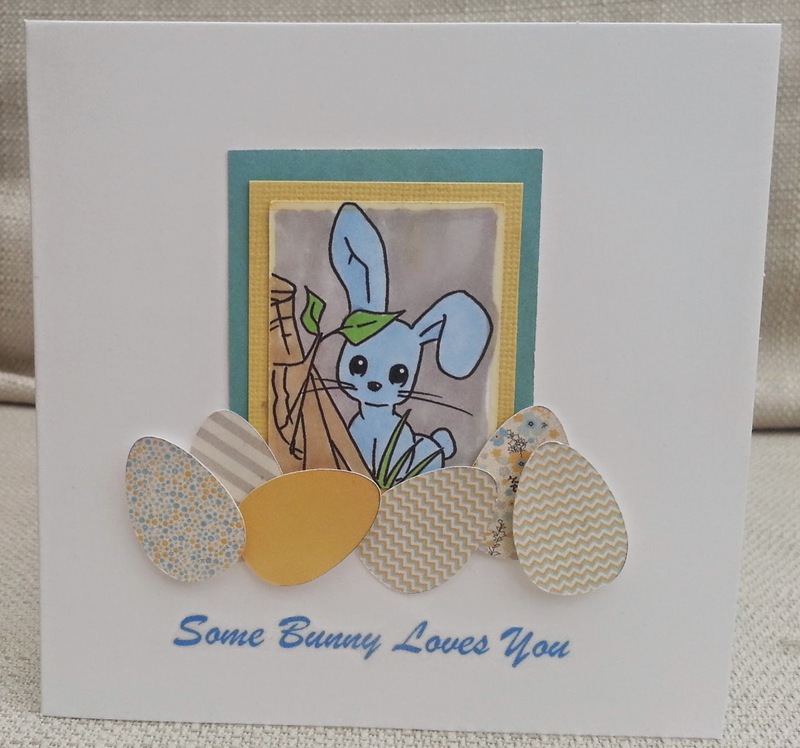 For my card I used a Silhouette cutting file of bunnies and a Samantha Walker digikit called 'Cottontail'. Elaine, beautiful cards from the DT, a DT call and , of course, we'd love you to make a project using our sketch and enter the challenge. Inspired by the theme'gingerbread' at Holly Jolly Christmas Challenge , I stamped the jar of gingerbread men on the left(Molly Bloom), coloured it, cut it out and realised it was just too small for a focal point. 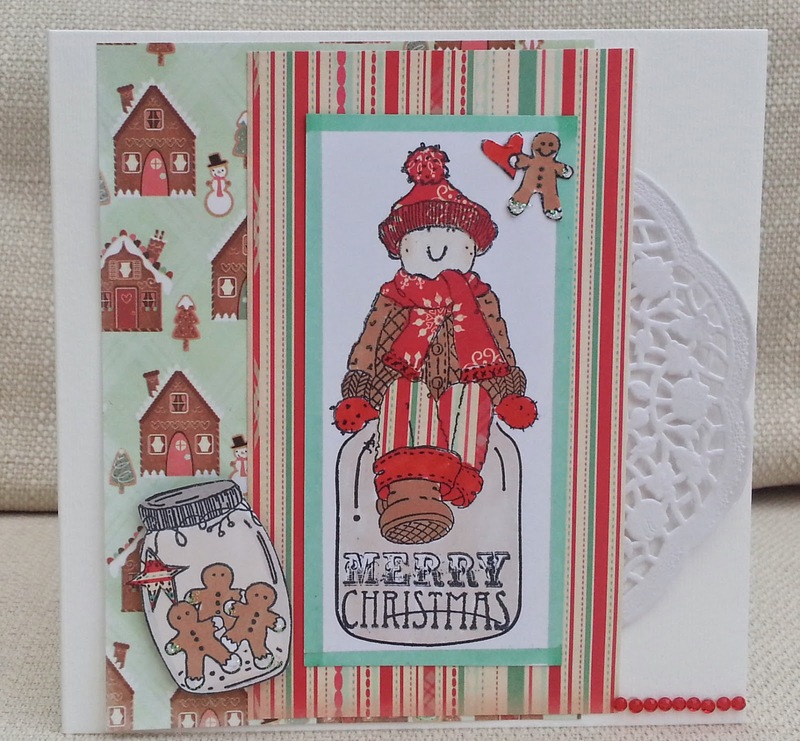 I then stamped the boy and tried sitting him on the jar - but then you couldn't see the gingerbread! Eventually, I masked him off and used an empty jar from Stampin Up with a sentiment (Woodware). I cut a gingerbread man from another Molly Bloom stamp and put him in the top left. 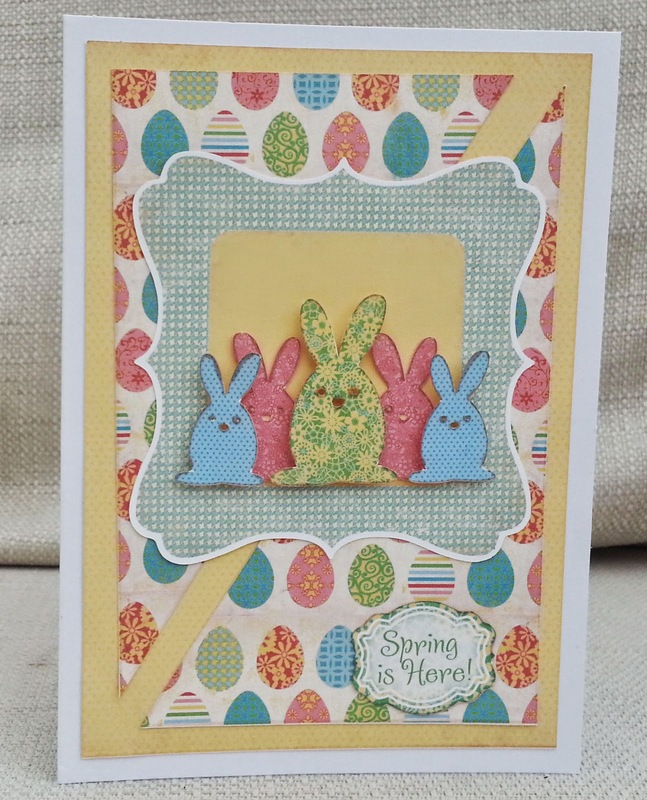 It's not my team's turn to create at Pinspirational Challenges this week - but when I saw this cute bunny digi from our sponsor, Dorky Prints, I couldn't be left out. A few years ago, I bought a friend some bright green gloves to wear with her bright red coat. She sent me a 'thank you' card saying, 'I now feel like the kind of confident person who can wear bold, clashing colours.'! I hope this is the kind of confident card that can take bold clashing colours! I like this colour combo, but I'm sure it's not for everyone. I love the stamp, 'Lulu Loves Poppies' by Stampin Bella and, as poppies are often associated with rememberance, I wanted this to be bright and happy. The poppies were cut on the Silhouette cameo with Ranger liquid enamel middles. This stamp (Papermania) isn't actually a Christmas stamp, although I've used it on a Christmas card before. 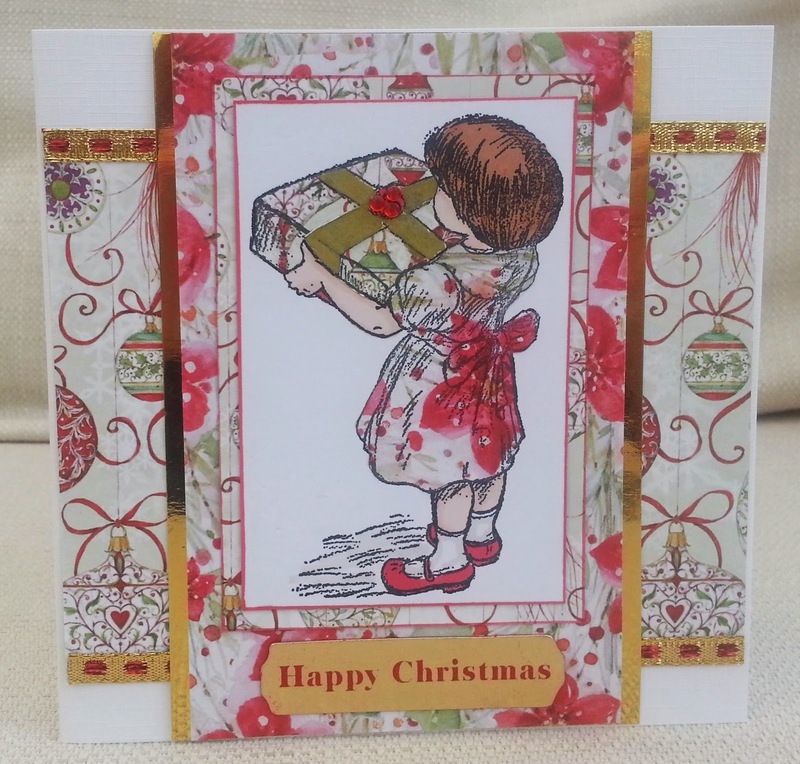 I've paper-pieced it with Wild Rose Christmas papers (magazine freebie). 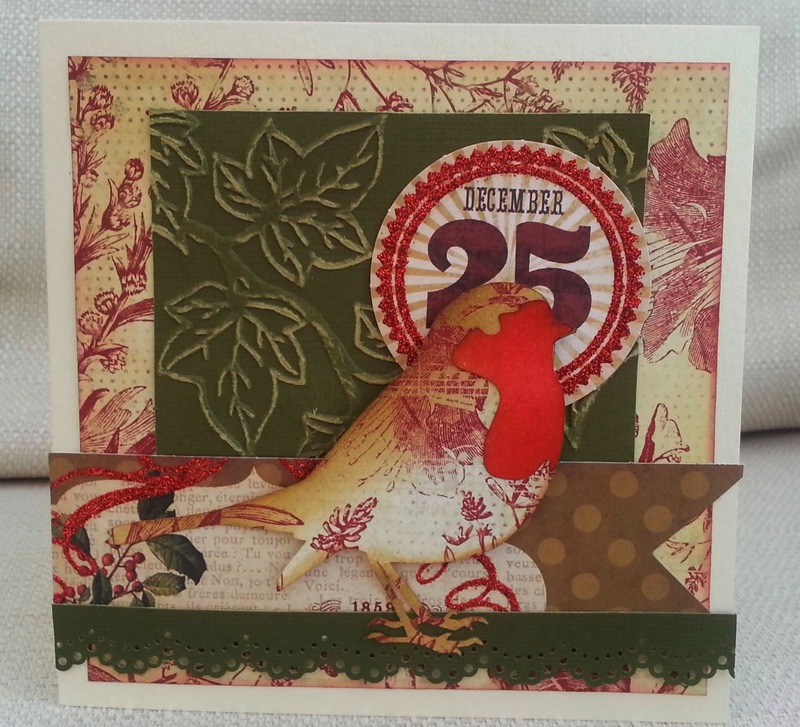 I used the sketch from Christmas Challenges and the bingo card from Holly Jolly Christmas Challenge - gold, more than 3 layers, ribbon . (The gold and red ribbon is trimming the back layer.). 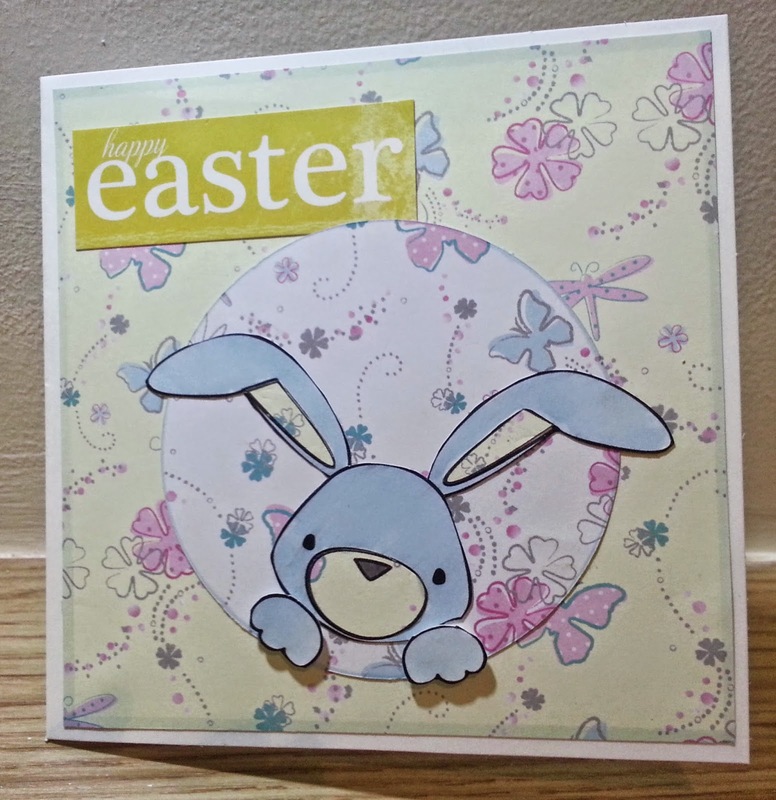 I made this card using the sketch from CD Sunday and the Docrafts Digital Designer'Tulip and Friends' CD rom. Here is another example of me straying from my original ideas! My idea was to make a dead-creature-free version of a Victorian butterfly collector's box. But somehow I ended up adding some really bright non-Victorian colours! 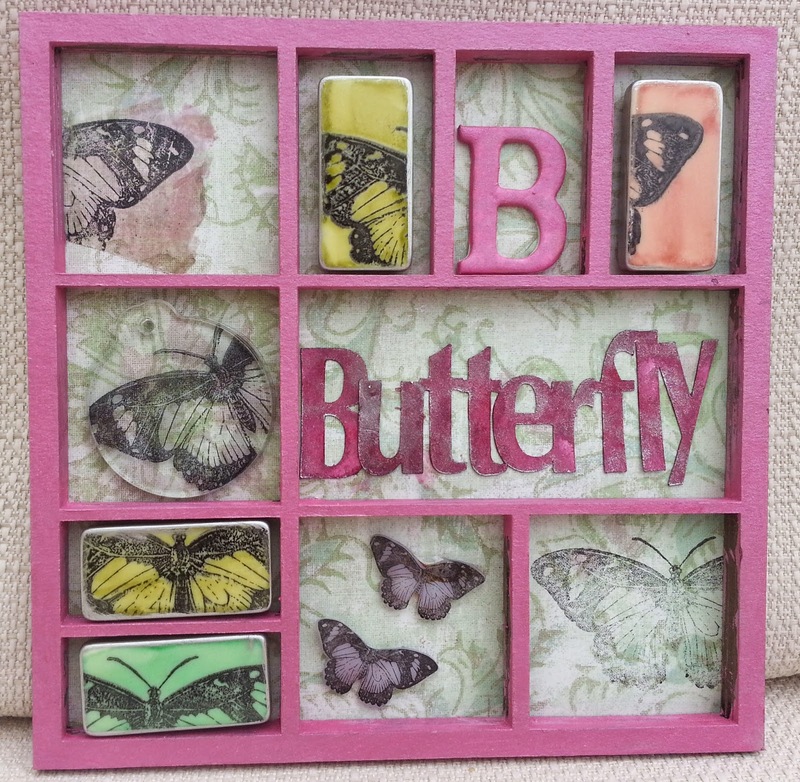 I used one stamp - a very old one by Anita's and used it in several different ways - on dominoes, on a wafer of mica (with added Pearl Ex) , onto a Tim Holtz 'fragment', onto shrink plastic and directly onto the backing paper. 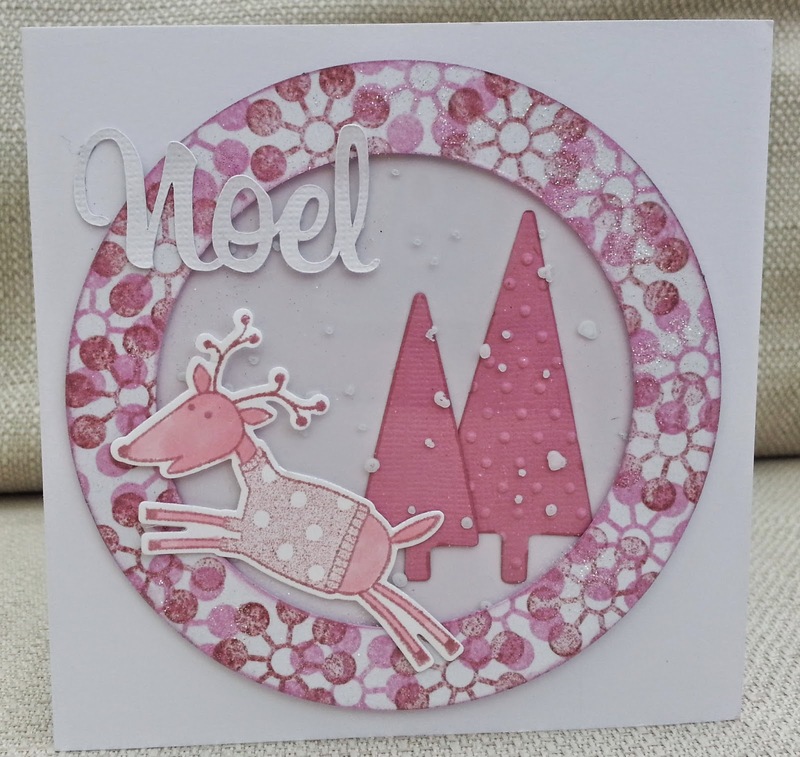 I cut the word on the Silhouette Cameo and coloured it with Moonglow Starburst Stain. 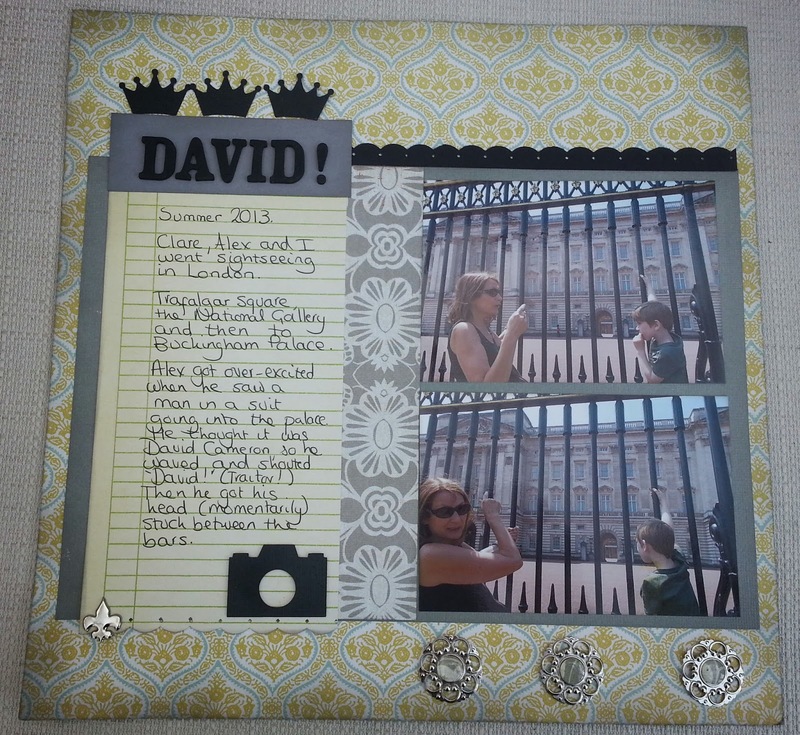 The frame is a Tando Creative mini printer tray that I painted with pink acrylic paint. For my DT card, I was inspired by the hexagons on a turtle's shell. 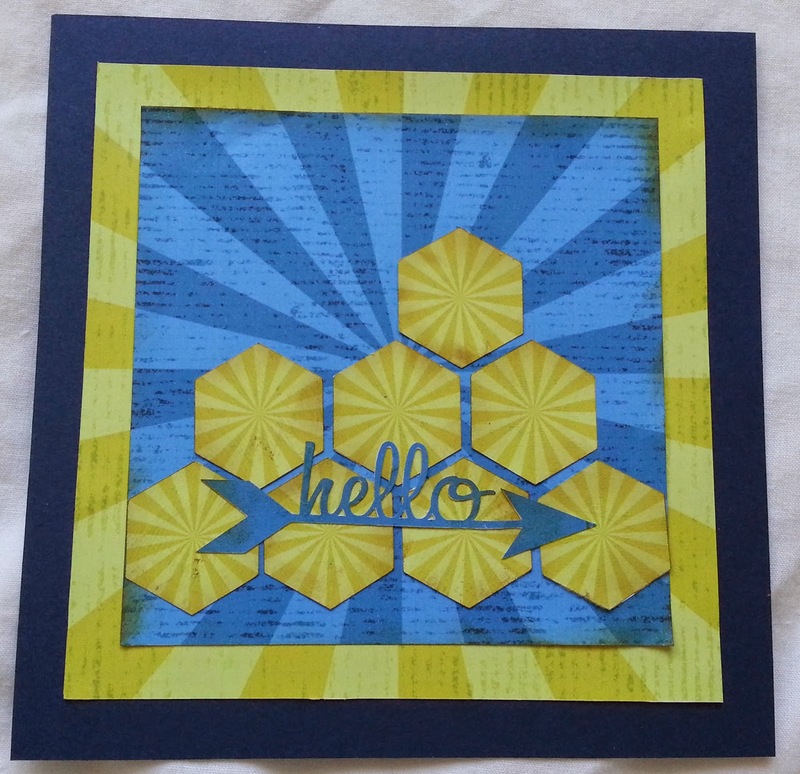 The papers I used were generously provided by our sponsor , Imagine That - I love the sunburst design and because they're digital, I was able to scale them down for the hexagons (which I cut on the Silhouette). 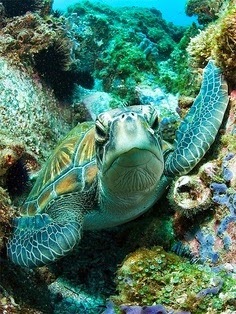 How does this picture inspire you? Come over and join in at Pinspirational challenges.